So, I know I haven’t been the greatest at blogging in a timely fashion, but I promise to be better! It’s a new year, and it smells fresh and exciting. I know in my last post, I talked about my resolutions, but I have a couple I want you all to make to yourselves. 1. Believe in yourself. You are a wonderful, beautiful soul and you can achieve anything you put your mind to. Trust me, I know how hard it can be when you hear words thrown at you, and people breaking you down, but don’t believe them! Believe yourself. No one knows you the way you know yourself, so why not believe in that person? 2. If you’re going through something rough, reach out to someone. I know I have said that before, but it is so important. You are not alone, there are people who love you and want to help you…let them. 3. Dream big. Look inside of yourself, realize your potential and know that no dream is too big. I was lucky enough to travel to Indiana with Stand for the Silent to help speak at a couple of schools. We talked to 800 students, of all ages. It was life-changing. When a girl comes up afterwards to say that she had a plan of taking her own life–the time, method, notes written, etc–it changes your life. I shed quite a few tears, and I am still speechless at what an incredible experience that was. I wish organizations like this existed when I was in school, or that I at least knew about them. But, we’re here now to help this generation, and maybe they will help the next, and so on. You CAN make a difference, all of you! I have a movie suggestion for you all. If you’re looking for an up-lifting, inspiring movie where a boy overcame serious obstacles, chased his dreams when everything seemed unattainable, and became an amazing artist–please rent My Left Foot. It is one of the most incredible and inspirational movies I’ve ever seen, and it’s one everyone should see. Alright, friends, I am going to leave you with this. Remember this! 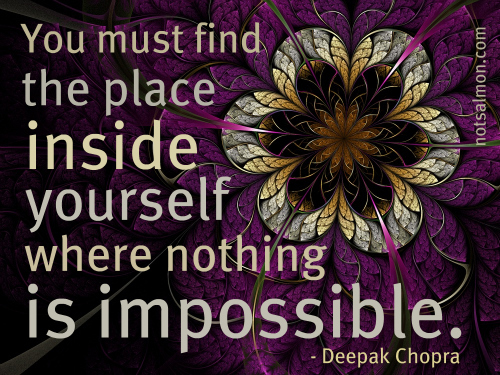 Absolutely nothing is impossible. Believe that.